Baptism—We've Got It Right...and Wrong considers why Baptists must rethink baptism in this post-denominational age. Tyler reviews what the Bible says about baptism and provides a solid survey. Learn how and why the practice of baptism changed in church history, including the return of believer’s baptism at the dawn of Baptist history. Explore the question facing many families and Baptist churches today as Christians from other denominations enter Baptist church doors: Should the rebaptism of Christians from other denominations be a requirement for Baptist church membership? Baptism—We’ve Got It Right...and Wrong is a decidedly honest look at this biblical and sacramental practice of today's believing church. The complications arising from different baptismal practices can create confusion for today’s churches. Tyler argues for a renewed focus and understanding of Baptism. 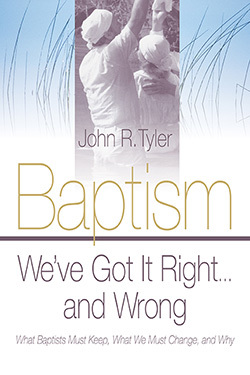 Bring renewed vitality to your church's observance of baptism using Tyler's insights. Each chapter includes a guide for discussion and questions for individual reflection or group discussion. Also, the appendix connects the chapters for ministerial application. Baptism—We've Got It Right...and Wrong is a wonderful resource for those new to the Baptist faith and for lifetime Baptists. 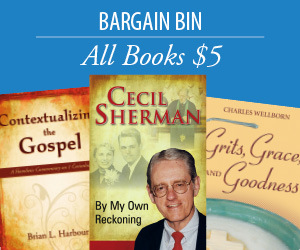 Call about our church bulk discount. John R. Tyler is a laymember of Kirkwood Baptist Church in St. Louis, Missouri where he is a deacon and adult Sunday school teacher. He was the Cooperative Baptist Fellowship of Missouri’s first moderator. He has served on the national Cooperative Baptist Fellowship’s coordinating council and was the organization’s seventh moderator in 1998-99. He had a 30-year career with SBC Communications. His interests beyond theology include art deco, antique radios, vacations on and by the sea, the St. Louis Symphony, and live theater. "John Tyler has the wisdom of Brooks Hays and the experience in Baptist life that very few people have. John’s book is thorough, well researched, fair, courageous and very readable. Both lay and clergy will profit greatly from reading it." "John Tyler has provided for us a resource that is both practical and carefully researched. By focusing on the essence of what it means to practice the Baptist tradition of believer’s baptism, Tyler captures what it means to be church." "John Tyler gives thoughtful guidance to Baptists who are addressing crucial questions about a cherished symbol and practice. He shows how a church may engage contested issues with thoughtful theology, congregational participation, and civil discourse."